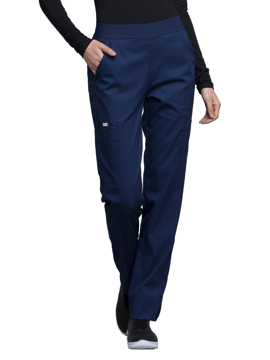 This pant features a knit waistband with encased elastic, functional drawstring, front patch pockets, zipper cargo pocket, back patch pockets, signature logo rivets, tapered leg styling, and side vents. Regular inseam: 30½". Petite inseam: 28". Tall inseam: 33½". Contemporary fit. Six pockets: slash pockets, back pockets, welt cargo pockets. Full elastic waistband. Instrument loop. Bi-stretch fabric. Tapered leg. Regular inseam: 30". Petite inseam: 27½ ". Tall inseam: 33". 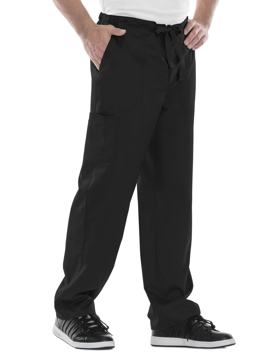 A men's tapered leg pant with a functional inside drawstring and back elastic waistband feature five belt loops and a zip fly with button closure. Also featured are front patch pockets, interior cellphone pocket, logo label with bungee loop, right double cargo pocket with snap I.D. loop, back patch pockets and knee seams. Regular inseam: 32". Short inseam: 29½". Tall inseam: 35". Contemporary fit. Nine pockets: patch pockets, cargo pockets, back pockets. Knit elastic waistband. Bungee instrument loop. Signature tonal woven label. Pop tonal topstitching. 4-way stretch. Resists wrinkles. Moisture wicking. Easy care. Regular inseam: 30½". Petite inseam: 28". Tall inseam: 33½". 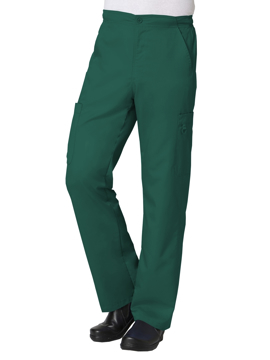 A natural rise, tapered leg, pull-on pant features an all around elastic waistband with Dickies logo twill tape on the inside back waistband and as an instrument loop on the right cargo pocket. 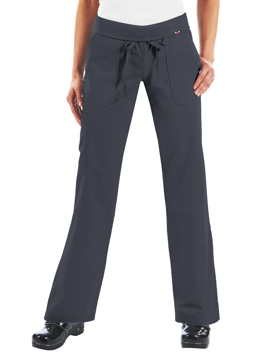 Also featured are slash pockets and cargo pockets with a stretchy knit interior pocket. Regular inseam: 30½". Petite inseam: 28". Tall inseam: 33½". 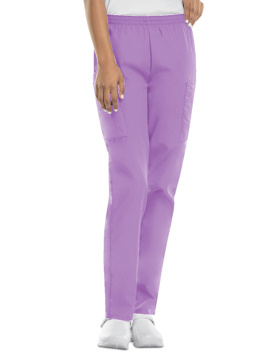 A contemporary fit, mid rise, straight leg pant features a functional drawstring with elastic waistband and a Dickies logo camo print inside facing. Also featured are side angled pockets, a cargo pocket with utility loop, a back pocket, double and triple needle topstitching and side vents. Regular inseam: 30½”. Petite inseam: 28". Tall inseam: 33½". 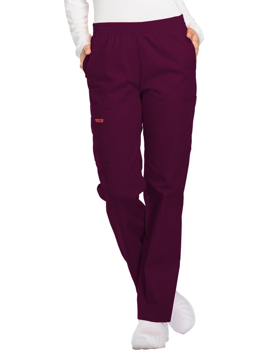 A contemporary fit, low rise, tapered leg pant that features a functional drawstring; all-around elastic waistband and leg openings made of rib knit; and signature triple-heart and dotted-heart heat transfers. Also featured are front rounded pockets (the right with a pen slot), a zip-closure slit pocket, rounded back patch pockets and a locker loop. Regular inseam: 29". Petite inseam: 26½". Tall inseam: 32". 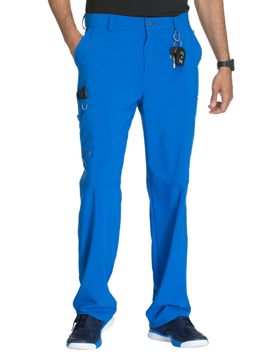 This pant features textured half elastic waist with full tonal twill tape tie, curve hugging back yoke, two angled hip pockets, one angled cargo pocket, forward facing action leg vent, reflective Jockey logo, and a 16" tapered leg opening. Regular inseam: 32". Petite inseam: 30". Tall inseam: 34". 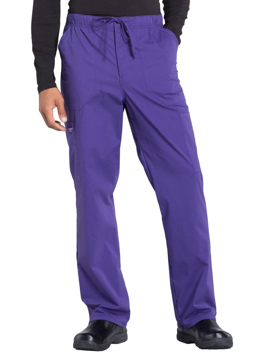 This pant features a yoga-inspired comfort waistband, sleek side hip secured zipper pockets with texture angled panels, forward facing action leg vent, reflective Jockey logo, and a 16" tapered leg opening. Regular inseam: 32". Petite inseam: 30". Tall inseam: 34". 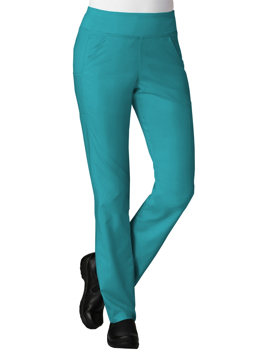 1" soft comfort pull on full elastic waist pant. Stylish tapered straight leg design with side vents. Two curved front hip pockets. 16" leg opening. Regular inseam: 31½". Petite inseam: 29½". Tall inseam: 33½". 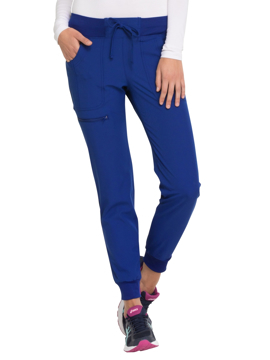 This pant features a folding elastic rib waistband which can be worn up or down, drawstring at waist, two front pockets, two back pockets, side pocket, and slight tapered leg styling. Regular inseam: 31". Petite inseam: 29". Tall inseam: 33". Tapered pants with half elastic waistband. Functional zipper fly with dyed-to-match inner drawstring. Side panels. Two front slant pockets. Two cargo pockets. One mesh pocket with twill tape. One pen slot pocket with triangle ring. Two back patch pockets. Regular inseam: 31". Short inseam: 28½". Tall inseam: 33½". Tapered pants with embroidered Eon logo waistband. Dyed-to-match drawstring. Two slant patch pockets with cell pocket. Two back patch pockets. One cargo pocket with scissor pocket. Side vents. Regular inseam: 30½". Petite inseam: 28". Tall inseam: 33". Yoga style waistband. 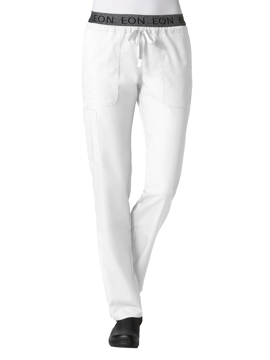 Tapered pants with side panels. Two slant pockets with cell pocket. One mesh pocket with twill tape. Two patch pockets. One cargo pocket. Regular inseam: 30½". Petite inseam: 28". Tall inseam: 33½". 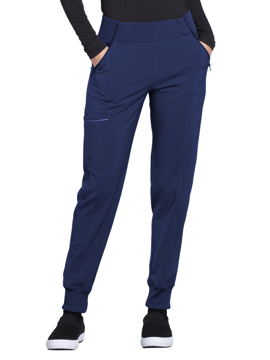 This pant features yoga knit waistband with front ties, two side cargo pockets, two back pockets with reflector, and tapered leg styling. Regular inseam: 31". Petite inseam: 29". Tall inseam: 33½". 3-pocket mid-rise cargo shaped leg pant with flat front twill tape tie, branded inside logo elastic waistband and side vent detail. Regular inseam: 31½". Petite inseam: 29½". Tall inseam: 33½".